Dr. Karen Grove, San Francisco State University, is investigating the role of contractional deformation in a transform setting along the Point Reyes segment of the San Andreas fault, California. Dr. Grove and her students, Jennifer Davis, Tandis Bidgoli, Rick Ford, Jeff Ham, and Alex Biggar, are evaluating vertical deformation using uplifted coastal terraces. They are mapping terrace surfaces to determine the amount of strain, obtaining ages from terrace sediments to calculate the rate of strain, and constructing data visualizations to demonstrate the style of strain. Project goals are to understand the temporal and spatial distribution of vertical deformation and to identify the structures (faults and folds) that accommodate that deformation. Funding was provided by The Petroleum Research Fund of the American Chemical Society ($30,000, 2000-2002). Davis, J., and Grove, K., 2001, Marine terraces near Bolinas, California, and implications for uplift of the Point Reyes Peninsula: Geological Society of America Abstracts with Programs, v. 33, n. 3, p. A48. 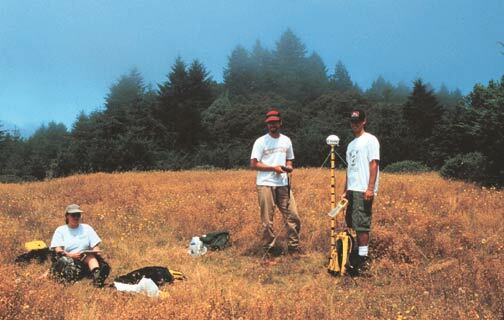 Bidgoli, T., and Grove, K, 2002, Determining uplift rates and patterns from Quaternary marine terraces of the Point Reyes Peninsula, California: Geological Society of America Abstracts with Programs, v. 34, n. 5.